Beauty comes in all colors, express yourself with the enchanting brilliance of richly hued diamonds! 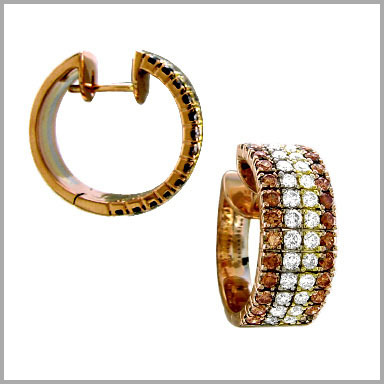 These earrings are crafted in polished 14K white, rose, and yellow gold. Each features various diamonds in prong settings, including: 26 chocolate, 13 yellow, and 13 white. They complement the coordinating gold settings in four luscious rows of blissful radiance.